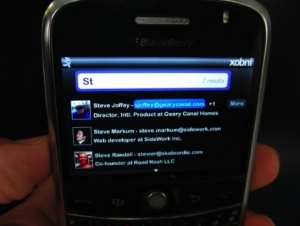 Xobni coming to BlackBerry | BlackBerry Blast! Do you use Xobni for Outlook? You know the plugin with the weird name (inbox spelled backwards). The Outlook plugin makes Outlook much more usable with incredible search capabilities. If you haven't tried it, check it out. Now the company is apparently ready to make a version for BlackBerry. This pic has leaked and xobni users are excited. "Xobni, which is a plug-in for Outlook that incorporates data from various social networks, currently does not have a mobile client. But the company has hired a small team of engineers to work on mobile apps, with Blackberry being the first device to get one." According to TechCrunch the app could be released this summer.